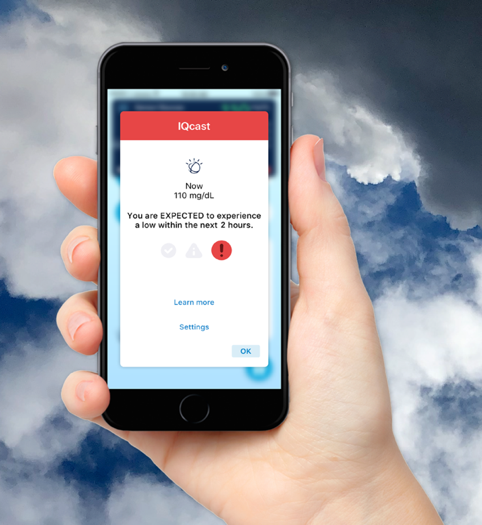 A new hypoglycemia prediction feature in the Sugar.IQ app, IQcast, is now available in the US for Guardian Connect continuous glucose monitor (CGM) users. This feature aims to give users 1-4 hours of advance notice if a low event is predicted to occur. The next-gen MiniMed 780G advanced hybrid closed loop is expected to launch by April 2020, adding automated correction boluses for high blood sugars, Bluetooth, and a mobile app for remote monitoring. Three years ago, Medtronic and IBM promised to launch an app that could predict hypoglycemia hours in advance, using the supercomputing power of IBM Watson. 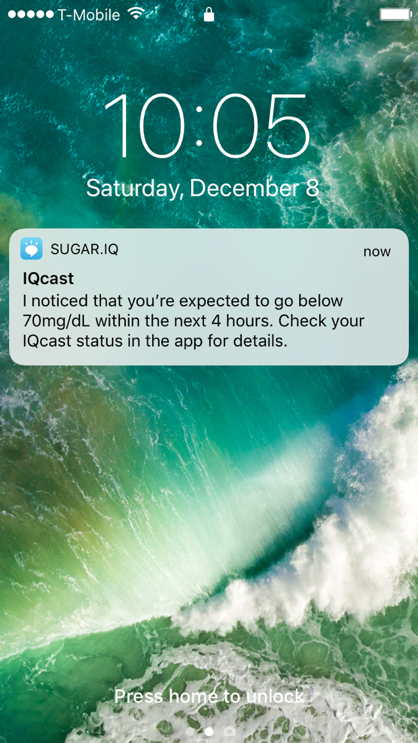 That feature, IQcast, is finally available in the US for Guardian Connect CGM users using the paired Sugar.IQ app. IQcast aims to add more value by notifying users if low blood sugar is expected within the next 1-4 hours (see example on right), giving earlier notice than typical CGM alarms. Assuming it does not generate too many false alarms, a passive nudge could be helpful for users. All the data is crunched in the background, meaning the Sugar.IQ app does not need to be open for these predicted low IQcast notifications. Can the app really predict a low this far in advance? The app’s algorithm – powered by IBM Watson – analyzes several signals such as CGM trends and user behavior to assess whether a user has a low, medium, or high likelihood of hypoglycemia. (For instance, likelihood of a low might be higher if a user has had many lows at that same time of day and took a larger-than-expected dose of insulin.) Medtronic and IBM have previously claimed 80-90% accuracy up to four hours in advance of a low; we’re not sure if this impressive accuracy will hold up in real-world use. We look forward to test driving this technology to see if it holds up against the unpredictability of real life! Medtronic has not shared when the Sugar.IQ app will be available for US Android users or those outside the US. To start, the Guardian Connect CGM app is expected on Android outside the US by this coming April; Sugar.IQ will presumably follow that. The MiniMed 780G automated insulin delivery system will bring several exciting updates to the existing 670G: automated correction boluses for high blood sugars, Bluetooth connectivity, and remote monitoring (for caregivers) and software updates. The automated correction boluses are particularly exciting, as they should improve time-in-range and reduce user burden. Early feasibility studies of the 780G show a time-in-range (70-180 mg/dl) of around 80%, up by two hours per day from the 70% time-in-range seen in real-world 670G user data and the pivotal study. We expect the MiniMed 780G system will also upgrade the Guardian Sensor 3 CGM for “non-adjunctive use,” enabling bolus insulin dosing without a confirmatory fingerstick. This labeling change will also allow the system to qualify for Medicare coverage, a drawback of the 670G/Guardian Sensor 3 right now. Tandem expects to launch its Control-IQ system this summer with Dexcom’s G6, which could be the first hybrid closed loop to launch with automated correction boluses. Could Your Refrigerator Be One of the Factors that Affect Blood Glucose?